Media captionTheresa May: EU and European press trying to affect the result of the UK general election with Brexit "threats" and "misrepresentation"
A few days ago it was just "Brussels gossip". Yesterday she swore to be a "bloody difficult woman" - stern words. But this morning, the chancellor and the Brexit secretary said the noises off out of Brussels and suggestions of an exit bill of 100bn euros were only "manoeuvring" and that the UK would not be pulled into "megaphone diplomacy". 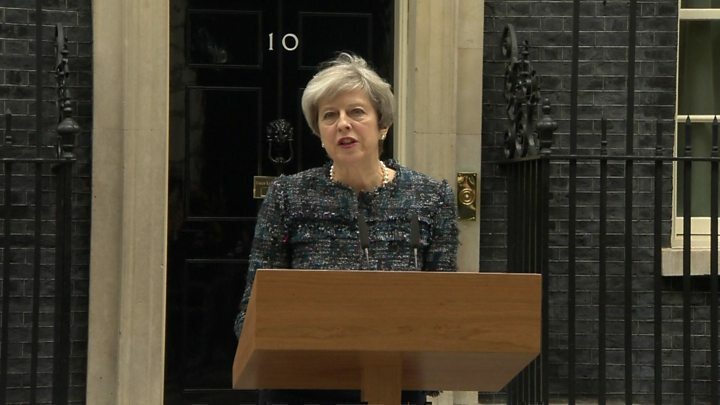 By 15:30, the prime minister was standing at a lectern in Downing Street accusing some in Brussels of trying deliberately to interfere in the election, to make trouble for her politically at home, and of wanting the Brexit talks to fail. She just used one of the most powerful microphones in the country for blunt diplomacy indeed. It's worth pointing out she made careful aim at the EU institutions, rather than the individual leaders, with whom she'll have to deal one on one. But forget that nuance for a moment - this was quite some statement, quite an accusation to make. It seems the prime minister is intent on playing the Brexit card for all it's worth in the next election. It's no coincidence that the Tories want every UKIP voter to turn to them, no coincidence that many Labour seats were Out areas in the referendum, no small matter that in 71 Labour constituencies, the UKIP vote was bigger than the size of the eventual majority. British prime ministers taking public aim at "Brussels bureaucrats" is hardly an original tactic from the playbook. And do not, for one second, be surprised if come 9 June, IF Theresa May is back in power, her language starts to sound rather more conciliatory. But words like this cannot be unsaid. What is perhaps more surprising is that Theresa May has gone full throttle at such an early stage in this election, and in a situation where the polls put her as the clear frontrunner.